Moksha provides a moksha.hub.MokshaHub class that makes it simple for applications to send messages to a given topic. Behind the scenes, the MokshaHub will automatically connect up to whatever message brokers are configured, and create a new session. The send_message() method will automatically handle encoding your message to JSON (unless you pass jsonify=False), and sending it to the appropriate message broker. The CentralMokshaHub is the primary consumer of all message topics. 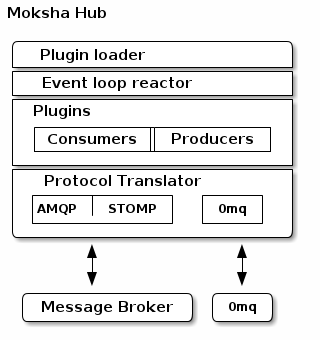 It runs outside of the Moksha WSGI application stack, and is automatically started by the $ ./moksha-ctl.py start or $ ./moksha-ctl.py start:moksha-hub commands (and can be started manually by running moksha-hub).